Sometimes I feel surrounded by fashion. I freelance at a clothing design company, I read plenty of woman-driven blogs and all my mags at least touch on it. Through it all I continue to view trends as fickle, disposable means of spending money. That's why I love this picture so much. Her dress is almost my age but Meryl Streep pulls it off with just as much aplomb. How wonderful would it be if we all purchased and wore what we loved until it fell apart, instead of when it fell out of favor? That is amazing! 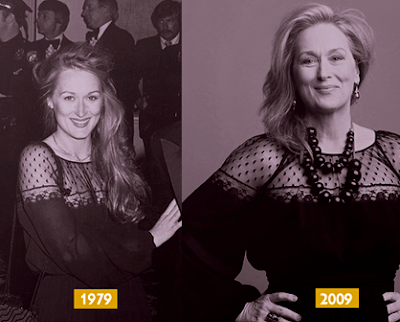 Good for Meryl. I still have a jumper from when I was child, it was huge on me then, and now it fits perfectly. Ha!